Ubytovala jsem se v tomto apartmánu již po druhé, a ráda přijedu i potřetí 🙂 Místo je prostě sympatické svou jednoduchostí a zároveň detaily. V nenápadnosti zde najdete vše, od komplet zázemí v koupelně (včetně fénu a potřeb) až po kapesníčky v kuchyni. Nesspresso už dolaďuje výborný dojem, stejně tak něco k zakousnutí alá nouzovka ve skříni. Je zde dostatek ticha a nerušeného zázemí ať už v „ložnici“ či v obýváku nebo u stolečku při kuchyňce. S ubytováním i „paní domácí“ Lenkou jsme byli maximálně spokojeni. Vše proběhlo hladce a ubytování naprosto splnilo naše očekávání vzhledem, vybavením i čistotou. Můžeme jen a jen doporučit! Lokalita: Sehr günstig gelegen durch Bahnhofs- und Zentrumsnähe. Trotzdem sehr ruhige Lage in kleiner Nebengasse. Zu Fuß ist die Stadt sehr gut zu erkunden. Klady: Het appartement ligt vlakbij het centrum. A walk distance from the very center of the town. The apartment is look like brand new. A huge selection of nice coffee for free . We have been late with arriving ( 4 o’clock at the morning ) , but the host was still waiting on us (specially „THANK YOU“ to your mom 🙂 ). Vo vybavení apartmánu bolo všetko čo človek potrebuje či už v kuchyni alebo kúpeľni. Síce nemajú recepciu alebo ubytovanie prebehlo hladko, apartmán ešte „voňal novotou“ . Pekné plus bola káva v cene a aj nejaké občerstvenie na raňajky. Lokalita bola tichá a blízko centra. Určite odporúčam a ak bude možnosť určite sa vrátime. Klady: Host-provided breakfast items, TV with many satellite channels, everything new/clean, the host, the location. Lenka’s place is awesome! It is a great location to explore the city of Brno from! Minutes walk from main train station, trams and everything. It was a great space – clean, open & all the comforts of home. Lenka is a great host, gives great sight seeing tips & traditional restaurant recommendations! She is very friendly and happy! We had a great time even though it was only an one night stay! Brno is wonderful & staying at Lenka’s is best! Superb experience! The apartment is wonderful. It’s spacious, clean, and nicely decorated. The bed and couches are very comfortable. Cereal, milk, snacks, and coffee are provided, which is such a nice touch. Lenka was great to deal with, very clear and accommodating. Check in and check out were easy. I also really appreciated that the apartment is only used for guests and so wasn’t full of personal belongings. Overall, I found the place to be very comfortable and would definitely stay here again if I returned to Brno. 전시회 목적으로 출장을 간 관계로 전시장과 멀지 않은 위치에 있어서 만족스러웠으며 아파트이기 때문에 편안한 숙박을 할 수 있었음. 무선인터넷도 매우 빨랐으며 마트가 근처에 있어 매우 편리했음. Propriétaire très gentille. J&#39;avais un retard de train et donc une arrivée très tardive et elle m&#39;a attendue et consacré tout de même du temps pour me montrer les coins à visiter pendant mon séjour et d&#39;autres informations pratiques. Best place we stayed so far. Thank you. You are wanderfull host! Our visit to Brno was enhanced by Lenka. She was accommodating, punctual, full of information and really nice as well. The apartment is spacious and well fitted out. Nothing negative at all. – No toaster or oven &#47; grill. This spacious apartment is in a recently renovated building on the edge of the main city area. Access to the main station, post office, trams, museums, shopping, restaurants and bars was all very easy. There is a large Tesco supermarket at the main station. The apartment itself was meticulously clean, has all modern facilities and a good kitchen area. The bed is very comfortable. Very fast WiFi was excellent. Lenka gave us a fabulous, well informed introduction to the apartment, the area and Brno in general. I would have no hesitation in staying at the apartment if we are ever in Brno again. – Nenasli sme ziadne chyby. Apartamento nuevo, limpio, muy cómodo y bien localizado. Buena relación calidad&#47;precio. Great location, affordable and friendly manager! – Everything was wonderful and well appointed. 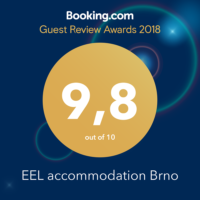 My wife and I had orginally booked at the EEL apartments for 5 nights and use Brno as base for some day trips in the region, but it was such a great apartment and there was so much to see we decided to stay an additional 2 nights. The apartment is about a 6 min walk from the train station and about an 8 min walk from the city centre. Lenka was there to meet us when we arrived and gave us a run down on the apartment, it was great to get some washing done. It is a beautiful apartment, spotless, with all the appliances of a regular apartment, and a steal for the nightly price. Lenka is amazing, and provided us with day trip recommendations and the tram numbers we needed to take to certain sites, she also helped me for three hours on a Saturday morning with a medical issue at the local hospital as my guide and interpreter. I cannot say enough good things about this apartment or the manager, Lenka and My wife and I would definitely stay there again. Lenka was a great host and the apartment worked well. We had everything we needed. The apartment is close walking distance to all attractions of the city. I hope we can return soon! – Велике ліжко, то два односпальних. Вигляд із вікна. Hands down the best apartment, value and quality in Brno. – &#39;Ubytování&#39; is Czech for &#39;accommodation&#39; – when we got to the bus stop and saw &#39;Ubytování 700yds&#39; we thought that was our apartment!! – I could hear some construction noise? (someone was hammering nearby) and the neighbors in the morning. Still, just a minor annoyance. – Not Lenka&#39;s fault, but we did happen to hit a week where prices were high because of a conference in Brno; this reduces our &quot;value for money&quot; score. 일반 주거건물에 있는 아파트이기때문에 미리 메일 확인을 하고 가야 함. 리셉션이 없기때문에 현관에서 누구를 호출해야할지 당황했다. 미리 메일로 도착시간을 알려 달라고 되어 있었으나 메일확인을 안해서 아파트 주인도 기다리고 있었다고 함. 면적도 넓고, 매우 친절하고 청결하고 시내 중심부와도 매우 가깝고 역 근처에 커다란 수퍼가 있어서 쉽게 음식물을 살 수 있어서 며칠이고 머물고 싶은 곳임. A quick visit to Brno to visit the caves and wine region. A very nice and quit hotel apartment with an excellent location almost in the center of Brno, only 5-6 minutes far from the main railway station. The apartment consisted of two quite big rooms and bathroom. The hotel had no breakfast room; you had to eat the breakfast in a cafe in the center or you could do it yourself (there was a good kitchen in the apartment). An excellent alternative for an independent traveller. Could be even 10.0 rated place, just the bathroom lagging behind a bit as it is quite worn out. – The apartment is very well maintained and very clean. Though you notice especially in the bathroom that the interior would need some refurbishment. It is very clean though. Do not expect anything like nice view from the window, for the price it is fair enough that you are just a nice walk up the hill from the vibrant city center. Lenka was a great host! – No proper shower, just a handheld attachment in the bath. Perfect city centre location and the cleanest place I’ve ever stayed! – Nieładny jest jedynie widok z okna na stare domy i zaniedbane podwórko. Lovely big apartment. Lenka the manager was so helpful and friendly too. Would definitely stay again.